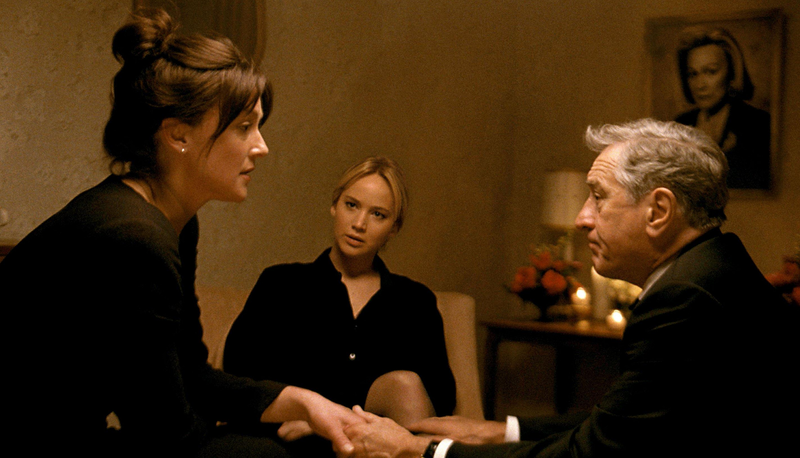 Loosely based on the early career of businesswoman Joy Mangano, Joy is a lighthearted drama that benefits from a committed Jennifer Lawrence performance but is also structurally unbalanced and underdeveloped in patches. Joy (Lawrence) is a financially struggling divorced mother of two young kids, with a chaotic home life. Her parents Terri (Virginia Madsen) and Rudy (Robert De Niro) divorced when she was a young child. Her former husband, lounge singer Tony (Édgar Ramírez) still lives in the basement, although the couple divorced two years prior. Terri is depressed and spends her days watching bad daytime soap operas. Rudy runs an auto shop, but after his latest relationship fails, he also shows up at Joy's house to share the basement with Tony. Her grandmother Mimi (Diane Ladd) is the one person who still believes that Joy, who was highly creative as a child, will make something out of her life. Rudy starts a new romance with the wealthy Trudy (Isabella Rossellini), triggering a yacht trip during which Joy accidentally cuts her hands mopping broken glass. This leads her to invent the self-squeezing, easy-to-clean miracle mop. With financial support from Trudy and disorganized and argumentative help from Rudy, Tony and her half-sister Peggy (Elisabeth Röhm), Joy starts to manufacture her product at a dubious California facility, and connects with Neil Walker (Bradley Cooper), an executive at television shopping network QVC. Joy gets deep into debt to pursue her dream, but achieving sales and success with the miracle mop will still not be easy. Jennifer Lawrence portrays Joy with an appealing mix of determination and pragmatism. Before she invents the mop, Joy's life is disintegrating around her ears, and she literally has nothing more to lose. Lawrence succeeds in making Joy's fightback towards personal happiness the believable quest of a smart woman tired of living life according to everybody else's rules. The rest of the film is entertaining without ever threatening to soar towards any peaks of achievement or emotion. Director and writer David O. Russell, again reunited with regular colleagues Lawrence, Cooper and De Niro, is uncharacteristically uneven. The scenes portraying Joy's home life as a madhouse in full swing are good, but there are too many of them. The business oriented narrative, once the mop starts to sell, is slapped together in a rush and remains unconvincing. The film reaches a relatively early highlight with Joy's personal appearance in front of the cameras at QVC. The subsequent events involving a patent battle with unsavoury businessmen in California and Texas are underdeveloped and start to border on glib comedy. The supporting characters surrounding Joy are more about quirky quantity than in-depth quality. There is plenty to enjoy as Joy's father, mother, grandmother, step-sister, ex-husband and then father's new girlfriend circle her life, either to provide support, peck away at her burgeoning success, or both. Russell accomplishes the difficult task of giving each role its due in relatively few screen minutes, but the abundance of people also means that they all have predictable and linear progressions. Bradley Cooper as QVC executive Neil Walker suffers the most. Walker's role in Joy's life appears driven more by star pairing than any real conviction, but Cooper does shine in one scene, artistically orchestrating sales behind the live studio cameras. The characters of Rudy, Trudy and Peggy often fall in the cracks between appealingly funny and disruptively conniving. Joy is an agreeable story of a woman rising from humble roots to achieve success. Ironically, the film itself is better in the disorganized household and less coordinated when it comes to business.